Sales is likely the only professional service that doesn’t require some type of study before beginning a career. Think about it: most, if not all, positions come with the pre-requisite of schooling. Your doctor didn’t wake up one day and declare, “I think I’ll try my hand at this medicine thing!”, and then show up for an interview the next day. Your lawyer doesn’t “wing it” on court cases or learn as she goes. What if your accountant just performed some on the job training by watching a previous accountant do math, but never had any schooling on it? It sounds ridiculous, but that is the commonplace “training” of salespeople. Furthermore, at least all the other professions have a common language they can refer to. How you manage your pipeline at your company could be completely different from another. What I term “qualify” you could take to mean a completely different thing. Yet, we throw a number at a salesperson we call it a goal and expect them to hit it; and when they don’t, it’s because they don’t have what it takes. When people approach us about sales training, we often hear it is about giving their people more tactics to close deals. If they just knew how to handle stalls and objections they would sell more. If they had more “talk tracks” they would get wins more. They just need more tools in their tool belts. Don’t get me wrong, all of that helps. But here are some other things to consider when determining if sales training is right for your company. 1. Are your people right for development? Does it really matter how many tools I give your team if they don’t want to use them? Let’s imagine the world’s most capable baseball team. They’re in shape, they’re fast, they win 70% of the time. With the right field manager, who can help them utilize their existing strengths and give them a slight edge over all the other teams, they could win 90% of the time. However, they show up for spring training with the mindset that they’re comfortable at 70%; that they don’t want to try new things because what they’re doing now works well enough. They are uncomfortable executing in a different way. 90% sounds good, but at what cost? Learning new ways to do things is hard, performing differently than the way you have always done things is even harder. Is your team coachable? 2. Do you have the right Process in place to support Sales training? I would love to tell you that I wake up every day, throw on my superhero cape, play my theme song, get in my invisible jet, and save sales teams all day from utter doom. But the reality is I can’t do it on my own. If you as a CEO are not coachable, convicted, and committed to fixing the problem then the problem doesn’t get fixed. It takes a village to train a sales team. Change starts at the top. Refer to the previously mentioned baseball team. If no one enforces the expectation that they complete and execute the training, what changes? Nothing. Are your sales managers going to play ball? Are they holding the team accountable? Do they have processes in place to do so? Will you be willing to set the expectation that they do? Professional development is great, and, in the end, we find people are grateful for it. However, change is hard and comfort zones are…well…comfortable. It is up to the leaders in the organization to create a culture of growth. 3. Have you clearly defined the strategy that you want your team to execute in sales? There are a lot of ways to define a strategy. Do you need to acquire more new business? Do you need to grow existing business? Do you need to increase awareness in the marketplace with regard to your products and services? Do you need to get referrals from your current customers? If you know your strategy, then defining what people you need in what seats, and what training those people need to enhance their capabilities to achieving specific goals becomes much easier. Not having a strategy is like telling our previously imagined baseball team to just “go win” before each game. Anyone can go up to bat in whatever order they want, it doesn’t matter who is on what base, and if you don’t feel like going all the way out to the outfield, no big deal. It doesn’t work like that. It doesn’t matter if you have strong players if you don’t have a strategy. Without strategy there is no end goal in sight, and people are lost and left to wing it on their own. 4. 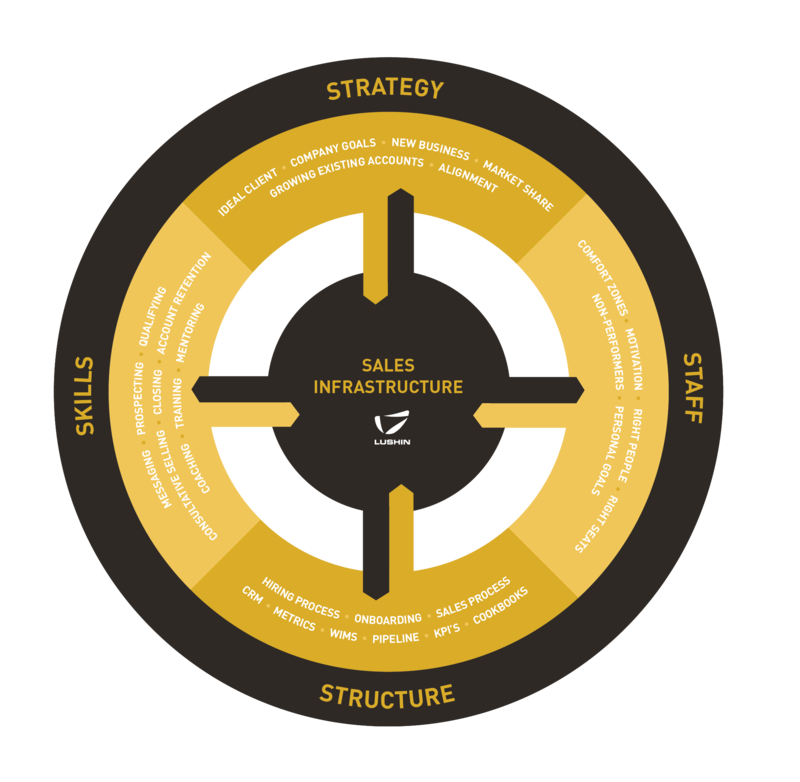 What skills need to be developed within your sales force? Are your people closing? Sometimes we hear that teams are closing, but they’re only getting in front of a small percentage of people, and they need help learning how to get in front of more people. Or sometimes we hear they’re getting in front of tons of people, but none of them are the right people, who can make decisions. Here’s another one: we get a lot of meetings that never go anywhere. Or, I feel like my people are order takers and not consultants. Sometimes, teams are lowering price instead of building value and profit is dwindling just to close a sale. Or, when we engage with some teams early on we find they have a hard time expressing what makes them different from their competition, and they’re being commoditized. Believe it or not, often times sales teams are uncomfortable asking their prospects about money or navigating a budget conversation. Or they are comfortable enough to do it but aren’t having effective conversations. Combined, a lack of specific and necessary skill sets can lengthen a sales cycle. On top of not closing enough sales in general, it’s taking many sales teams way too long to lose. As you go forward in evaluating professional development for your sales team, make sure you’re looking at the whole picture. Skills training is important but if you’re missing elements of having the right team, the right structure, or the right strategy, it will do little to grow your business. Focusing on the four important areas above is hard work that starts at the top of the organization and will eventually require all hands on deck. But in the end, you, your business, your clients, and your team will be better for it. Want to learn more about how Lushin's sales coaches work with clients to implement a comprehensive sales system? Connect with one of our experienced sales coaches today to get the conversation started!